Admittedly, when I first joined Twitter, it was all about getting more blog readers. I was obsessed with my daily numbers and a good friend and fellow blogger told me she'd seen her numbers double since joining the social media site. I signed up for my account over a year ago and while Twitter soon became more than just potential blog readers to me, it did help me build my readership and begin making a name for myself and my blog. Below, I have listed some tips and ideas for using Twitter to help you do the same. Twitter is generally about real time and even the most famous users with the most followers aren't going to make something go viral with one single post. The key to getting your link out there is getting the people who do follow you and who are watching when you post live to "retweet" your post. In a nutshell, retweeting means someone liked your post enough that they want to share with their followers, so they post it in their stream, as well, placing the letters "RT" to identify that it is a retweet and your user ID to identify that you are the original poster before the actual post. The more influential the person, or the more followers they have, the more likely your post will be retweeted again and again and again, with even more people taking notice. In the business world, word of mouth can be one of the strongest advertising tools there is. On Twitter, word of mouth is also the quickest way for something to spread. So how do you get people to retweet your post? For starters, you need to stand out. There are millions of blogs out there and most people are following hundreds of other Twitter users. There's no way any one person can keep up with every single blog or tweet. Your title or the words you use to accompany the tweet need to stand out and grab attention. You have to make people want to click on your link or you can forget being retweeted. Once you've decided on a catchy title, you need to make sure your post is engaging and appealing. Lists are always good ideas for posts because they aren't long and drawn out, and are easy to read. People don't have time to read long paragraphs about a topic unless it's something they're truly interested in. Make your post easy to read, easy to skim (most readers don't read word-for-word) and be sure to add pictures and bullet points to make your post appear more organized and visually appealing. So now you have your super-awesome article with a catchy title and you're ready to post it on Twitter. But what can you do to help ensure you get a few retweets? Make your Twitter post short. There's nothing more annoying than having to shorten someone's long-winded post in order to retweet. You can only change "and" to "&" and "three" to "3" so many times. You only have 140 characters to work with; make sure you leave room for your followers to add your username and "RT." On your blog, you can add buttons that allow your readers to tweet your posts, themselves. Tweet-this and TweetMeme buttons will allow readers to post your hard work with the simple click of a mouse. Post your articles more than once. Post at different times of the day, when different users are online. Most people won't mind your repetitiveness (especially if you post other things in between) and seeing the same title a few times over the course of a couple of days may even intrigue them. Just ask. This isn't my favorite way to go about getting a retweet. I find it slightly tacky and prefer to earn attention through hard work, not begging, but several influential and popular writers will add the words "please RT" to their posts and it seems to work for them. If you're not comfortable doing that, send out some direct messages (DMs) to a few twitter users who you have a good relationship with and who you think might be interested in what your post is about. You may even attempt to contact influential people with large numbers of followers. If your content is good quality stuff and the person is not a complete jerk, they will most likely help you out. Be pleasant and engage the people who do retweet or comment on your blog post or article. Thank them and answer their questions and chances are, they'll start paying closer attention to your future tweets. As a matter of fact, look for followers who share your common interests, especially if it's the topic you blog about. Befriend them and you've most likely got a new friend and reader on your hands! Planning to speak at or attend a trade show or conference this year? 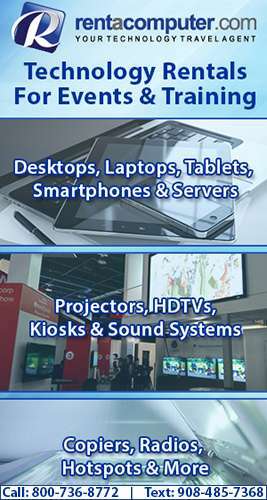 Then call 800-736-8772 or visit RentOurProjectors.com for an affordable projector rental anywhere in the US or Canada.